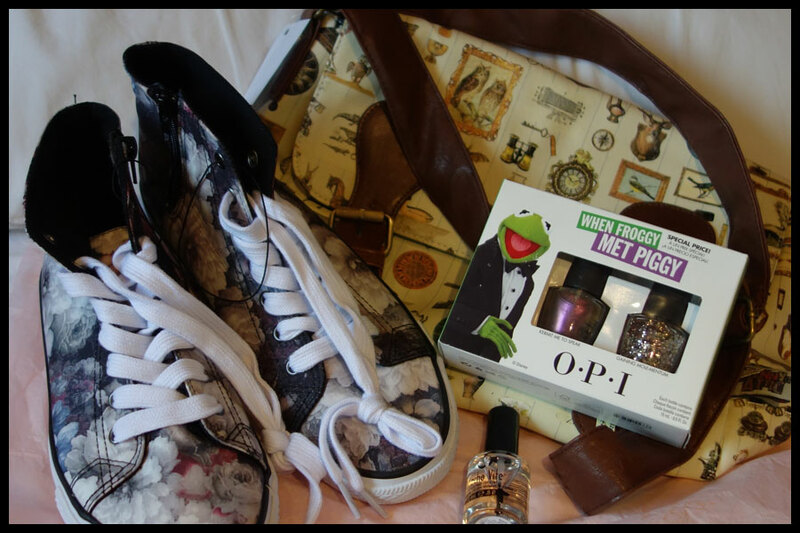 In my recent purchases I said I bought this When Froggy Met Piggy set of two OPI nail varnishes in TK Maxx. I’ve recently been loving my rose gold jewellery and the glitter in this has a very rose gold look which caught my eye. I did buy the mini five set that they released when the Muppets Most Wanted collection was released though it didn’t have Gaining Mole-mentum in. 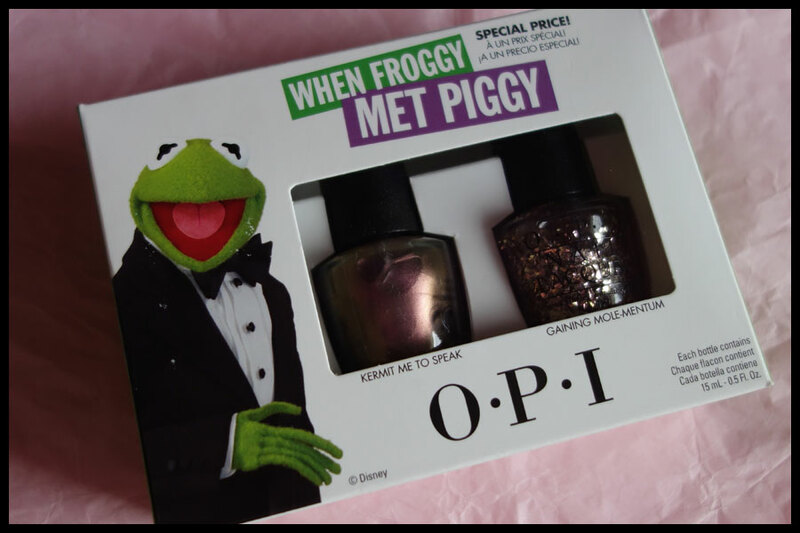 I am a big fan of the Muppets so this was one of the OPI collections that I really wanted to like though there weren’t really any in that set that impressed me but glitters tend to be a safe bet as opacity isn’t a problem as it’s just bits of glitter in a clear base. The two nail varnishes in this set are called Kermit Me to Speak and Gaining Mole-mentum. I do love the names of the OPI varnishes, I like how they’re normally puns and still within the theme though they don’t always have anything to do with the colour of varnish. This set was £9.99 in TK Maxx, though I can’t find it on their website there are quite a few other duos when you search OPI. There was at least one other Muppets one in the store and a few of the other pairs, mainly the ones with the tints or gems in them and a few of the pale shades pairs too. Today was one of those days where I went into town shopping just to wander round as something to do after having an appointment and not planning on buying anything, maybe a new top coat as mine has got to the point where I have to hold the bottle upside down and wait for it to drip onto the brush or some flat slip on shoes as I always try to find ones that fit my feet if I go anywhere with shops in the summer. I did get the top coat but ended up with others I really didn’t plan on getting.